www.askmrrobot.com is an amazing tool for optimizing your gear. The website will calculate which gems, enchants and reforges you need to meet critical break-points to optimize your dps, heals, tanking. This is not only a must-use tool for pve, mrrobot also works for pvp. This guild highly recommends each guild member employ mrrobot (which is 100% free to use) in lieu of other reforging add-ons. The image below is what you will find when you load your character. 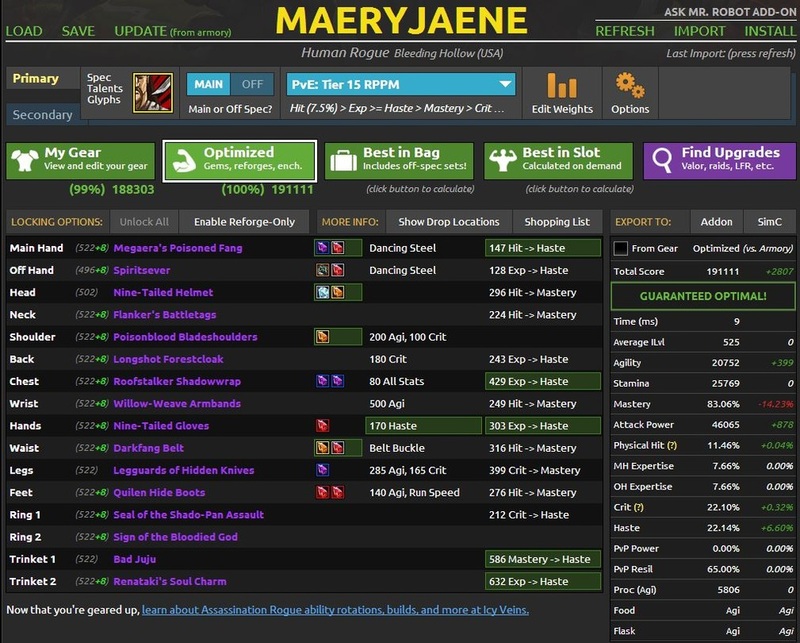 Make sure that you logged out of WoW in the gear-set you want to optimize. *Note: each time you make changes to your toon, you much log out so that armory updates the changes before the changes will show up on mrrobot. Askmrrobot pulls the info directly from armory so if you log out in your pvp gear but want to optimize pve you will have to log in, change your gear, log back out and click on the option at the top that says "update from armory." The image above is what you will see when you first load your character on mrrobot. It shows all the default settings. Below, I have changed the build from default pve to pve: tier 15 rppm AND I have clicked on the "optimized" tab. This has changed the weights of stats/breakpoints and it is showing me what I need to do to make those improvements. The center block of info lists gems, enchants and reforges. Wherever you see green blocks are things I need to change to meet these new breakpoints. When you have mrrrobot loaded, hover over the gems to see which gems it prefers. In the situation below, the build I've chosen is placing priority on haste over mastery so it's asking me to change agi/mastery gems to agi/haste gems. It's the same with that one enchant and those reforges. It's pushing out of mastery to dump more into haste. There is a bunch of conjecture about askmrrobot. Some people claim to love to calculate mathematical breakpoints themselves (which I, personally, think is an excuse for not wanting to spend the time/gold to optimize their toon each time they get new gear). Others just love their reforge addons. I have used the addons, mrrobot defaults and I've played with the weights on the "edit weights" and the best results I've gotten were from using mrrobot's pre-set builds. 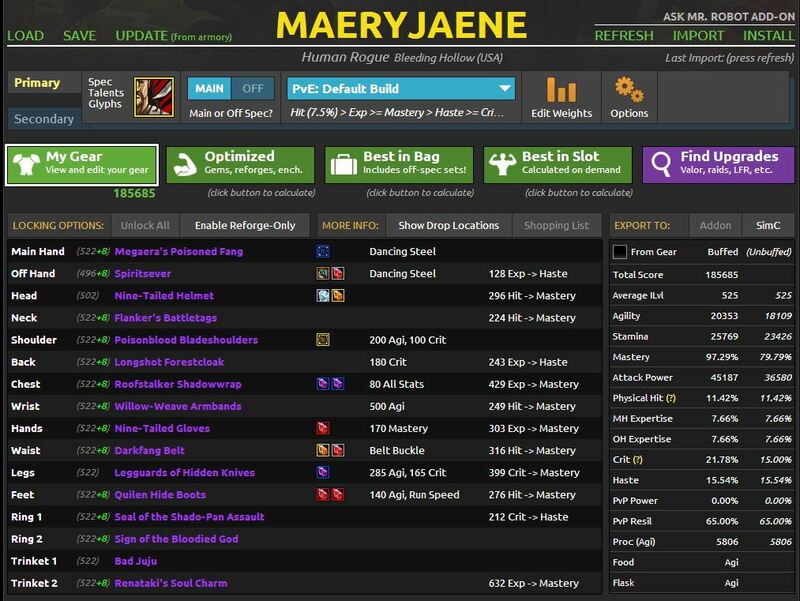 Some guildies have flipped their builds and gotten great results and that is terrific. However, if you go your own way and can't pull your weight in a raid, leadership will pull a mrrobot on your toon and ask you to amend your gear-build to match mrrobot. The majority of our core raiders use mrrobot and the numbers they achieve in raids is impressive. If you have specific questions about how to use this awesome tool, please contact members of leadership in-game.